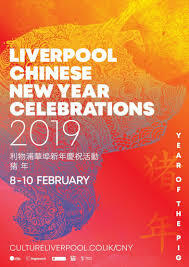 ROCK City Liverpool will celebrate the Year of the Pig with its usual programme of multicultural festivities commencing in Chinatown this Friday 8 February with a focus on the Chinese arch gifted by the City of Shanghai twenty years ago as a symbol of their ongoing close ties with the port city. Sunday 10 February will see varied and inclusive activities taking place including family friendly large scale events, education, and cultural experiences including an Augmented Reality trail. Chinese influenced street theatre in and around the arch will build up to a unique projection and pyrotechnic show ‘The Quest for the Arch’. The soundtrack will provided by renouned musician Jah Wobble and will feature a lumiere and pyrotechnic show from 6pm. Augmented Reality and Projections from Liverpool Chinese New Year 2017 were presented in September 2018 as part EU sustainable lighting event with LUCI part of the knowledge transfer and best practice programme in light management and animation from ROCK City Lyon. The Liverpool Augmented Reality Trail features a magical trail through Liverpool Chinatown containing immersive content linking the City to its Asian sister Shanghai. The point and click immersive experience contains both images and video content triggered at key milestones geospatially within the City historic Berry Street, Nelson street quarter located within the City UNESCO World Heritage site (Historic Pier Head, Merchants / Ropewalks area). The AR ROAR application is downloaded in advance with the intial marker starting at the National Museums Liverpool (Museum of Liverpool). An education pack for Chinese New Year has also been prepared by Arts Participation Team.